Pen and watercolor. 67 Biltmore Downtown Eatery & Catering in downtown Asheville, North Carolina. October 2017. Prints and postcards available. Copyright © 2017 Jennifer Russ, All Rights Reserved. A great place in the heart of downtown Asheville to get some good food or to meet a friend for coffee and to hang-out. I had made the initial sketch in pencil this March, and added pen and watercolor this October. Prints and postcards are now available from me, and postcards will soon be available at 67 Biltmore! Pen and watercolor of the Fine Arts Theatre in downtown Asheville, North Carolina. October 2017. Prints, cards, and postcards available. Copyright © 2017 Jennifer Russ, All Rights Reserved. One of Asheville's great downtown movie theaters, The Fine Arts Theatre, situated right near the center of town! Such an interesting building, I just had to sketch it. I added pen and watercolor at the end of October, and Loving Vincent was playing, so I decided to include that in my illustration. And I'm so glad that I did! What an incredible movie! Note cards, postcards, and archival fine art prints on cold press watercolor paper are available from me, and postcards are now available for purchase at Mtn Merch in Biltmore Village! Pen and watercolor. July 2017. Le Bon Café tiny house coffee truck in Asheville, NC. Copyright © 2017 Jennifer Russ, All Rights Reserved. The first time I saw this sweet Tiny House Coffee Truck, I knew I had to sketch it! And that is exactly what I did! Great coffee, great truck, great proprietors! I just love Le Bon Café! And as of Nov 30th, postcards of my painting can now be purchased at the tiny coffee house! Pen and watercolor. Stoney Knob Cafe. Weaverville, NC. Prints available. Copyright © 2017 Jennifer Russ, All Rights Reserved. I love having brunch at the Stoney Knob Cafe. Depending on when you arrive, there may be a wait, which is what happened to us when we were last there, so I decided to do a pencil sketch while waiting for our table. Late that night, I added pen while filming a time-lapse of the process (see below). I added watercolor another night. I'm really happy with how it turned out! Pen drawing with pencil removed. Stoney Knob Cafe in Weaverville, NC. May 2017. Prints available. Copyright © 2017 Jennifer Russ, All Rights Reserved. Salsas was one of the first restaurants I dined at after moving to Asheville in 2000, and it is still here! I love the bright yellow color! What a fun place! I woke up early on a Sunday morning so that I could sketch it without cars blocking my view. This is my newest watercolor from my Asheville, NC series! Pen and watercolor. Salsas in downtown Asheville. May 2017. Prints available. Copyright © 2017 Jennifer Russ, All Rights Reserved. Here is what it looked like before I added the sidewalk and color. Pen drawing of Salsas in Asheville, NC. May 2017. Prints available. Copyright © 2017 Jennifer Russ, All Rights Reserved. 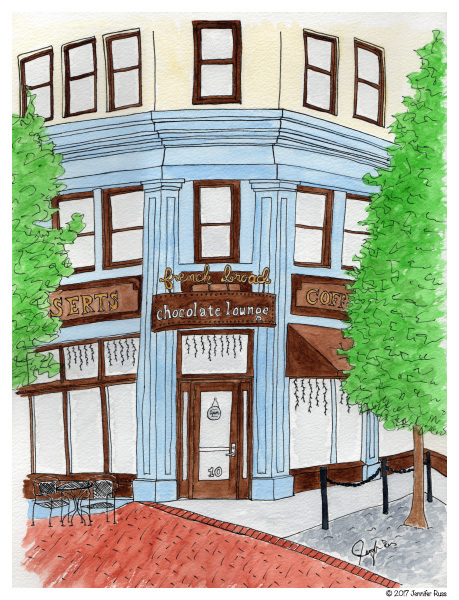 Here is another one of my recent pen and watercolor paintings in my Asheville, N.C. series. The French Broad Chocolate Lounge, located near the Vance Memorial and The Asheville Art Museum in downtown Asheville. I love this place and I love how the painting turned out! Pen and watercolor. The French Broad Chocolate Lounge in Asheville, NC. May 2017. Prints, cards, and postcards available. Copyright © 2017 Jennifer Russ, All Rights Reserved. I sat outside The Chocolate Lounge to do the initial pencil sketch. It was a beautiful sunny day. A great day to be outside. Here is my sketch after I added pen. 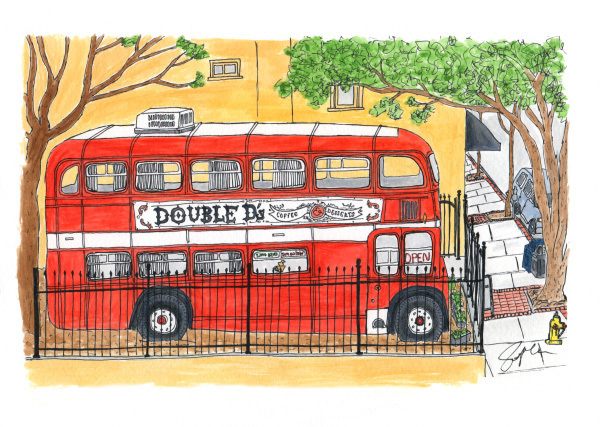 This double decker coffee bus was here when I moved here in 2000. I think it's great that you can get a cup of coffee and sit upstairs and hang out. I had to include it in my favorite places in Asheville series! And as of May 24th you can get a postcard of my painting while grabbing a cup of coffee at the bus! Pen and watercolor. "Red bus" March 2017. Asheville, NC. Prints, cards, and postcards available. Copyright © 2017 Jennifer Russ, All Rights Reserved. I love the bright red color of the double decker bus, but I have to say that I love the way the pen drawing turned out as well! I initially did this sketch in pencil, while looking at the bus, on a cold day (I had to put on my gloves), and then finished it with pen another evening in the warmth of my own home! Pen drawing. "Red bus" Asheville, NC. March 2017. Prints available. Copyright © 2017 Jennifer Russ, All Rights Reserved. I have always loved this fun and funky store in downtown Asheville! And when I saw there was a bench across the street, I couldn't help but sit down and sketch it! With such great colors, it's hard not to notice this shop. Next time you are downtown, check it out! And pick up one of my postcards along with other great gifts that they have in the store! Pen and watercolor. The L.O.F.T. of Asheville. March 2017. Prints, cards, and postcards available. Copyright © 2017 Jennifer Russ, All Rights Reserved. My sketch was done with pencil, which is still visible in this scan. Pen and watercolor were added on subsequent evenings. Pencil sketch with pen. The L.O.F.T. of Asheville. March 2017. Copyright © 2017 Jennifer Russ, All Rights Reserved. 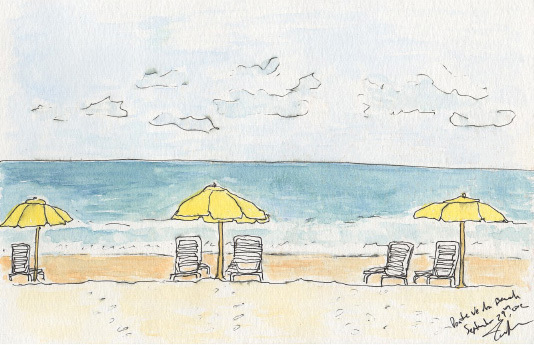 This pen and watercolor is from when we traveled down to Ponte Vedra, Fl this spring to see my grandma and the ocean! My grandma loved sitting by the grass coming up out of the sand. Such a wonderful time at the beach! Pencil, pen, and watercolor. "Beach Umbrella" Ponte Vedra, Florida. April 2017. Prints available. Copyright © 2017 Jennifer Russ, All Rights Reserved. I completed this drawing after being inspired at my yearly eye exam. No pencil. I took a photo before I left the Optometrist's office, and I got to work with pen and paper when I got home. I love the way it turned out! Fun! Thanks to Dr. N for suggesting I sketch this piece of eye equipment that I now know is called a phoropter! Pen on paper. "Phoropter" April 2017. Prints available. Copyright © 2017 Jennifer Russ, All Rights Reserved. In addition to my Asheville, NC series, I am currently working on a year long sketch-of-the day collection that began October 1st, 2016. 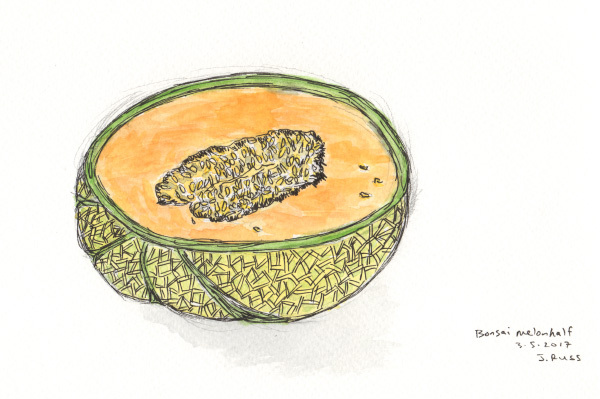 Although most of my sketches are quick, I turn some of them into more detailed watercolor paintings, as I did with this pineapple from my May 2012 - May 2013 sketch-of-the day collection. This pineapple is one of my favorite watercolor paintings that I did that year. Pen and watercolor. "Pineapple" October 2012. Prints available in various sizes. Copyright © 2012 - 2017 Jennifer Russ, All Rights Reserved. Pen and watercolor. "Red Tulips" October 2012. Prints available. Copyright © 2012 -2017 Jennifer Russ, All Rights Reserved. Pen and watercolor. 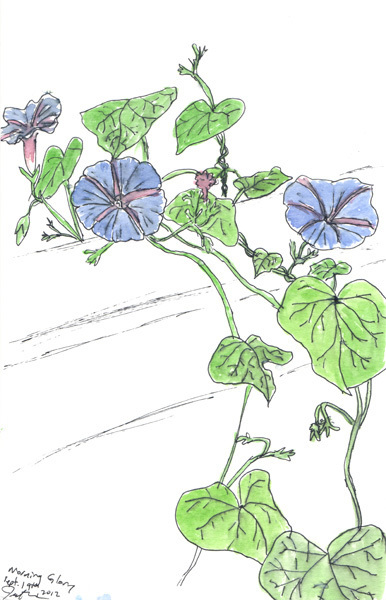 "Morning Glory" on my back porch. September 2012. Prints available. Copyright © 2012 - 2017 Jennifer Russ, All Rights Reserved. The following piece will always hold a special place in my heart, and was also painted in 2012. It was the first print I ever sold and is what opened my eyes to the possibility of following my heart and pursuing a career in something that I've always loved to do. With many thanks and much love to you, Abigail! Pen and watercolor. "Flowers in the backyard" September 2012. Prints available. Copyright © 2012 - 2107 Jennifer Russ, All Rights Reserved. Originally from north Florida, I like to travel at least once a year to the beach. There is something about the sound of the ocean, the pelicans flying overhead, the ocean breeze, the dolphins, I just can't go too long without it! Pen and watercolor. "Beach Chairs" Ponte Vedra, Florida. September 2012. Prints available. Copyright © 2012 - 2017 Jennifer Russ, All Rights Reserved. The following two pieces were completed while taking a Nature's Notebook drawing class at the local Community College. Thank you Peter for the beautiful plants and flowers you brought into class for us to draw and for your wonderful instruction! Watercolor and colored pencil. "Camellias" March 2017. Prints available. copyright © 2017 Jennifer Russ, All Rights Reserved. Colored pencil. Bamboo on newsprint. January 2017. Copyright © 2017 Jennifer Russ, All Rights Reserved. The following drawings are from my current sketch-of-the-day collection that began in the fall of 2016. Pen and watercolor. "Kiwi" March 2017. Copyright © 2017 Jennifer Russ, All Rights Reserved. Pencil, pen, and watercolor. "Bonsai melon half" from Trader Joe's. March 2017. Copyright © 2017 Jennifer Russ, All Rights Reserved. Pen and watercolor. "Red Pepper" March 2017. Prints available. Copyright 2017 Jennifer Russ, All Rights Reserved. Pen and watercolor. "Lenten rose" at the WNC Arboretum. February 2017 Asheville, NC. Copyright © 2017 Jennifer Russ, All Rights Reserved. Pen and colored pencil of a prickly pear cactus at the WNC Arboretum. February 2017 Asheville, NC. Copyright © 2017 Jennifer Russ, All Rights Reserved.